Scanpst is an inbuilt tool in MS Outlook that helps the user to repair the damaged and corrupt PST files irrespective of the level of corruption. Sometime it seems that the concerned PST files are inaccessible and cannot be repaired at any cost, but on professional guidance when user ties to fix them using the inbuilt tool, the entire disengaged PST files becomes accessible. This creates a chaos between a novice and experienced user. Some users believe that the intensity of PST corruption is so severe that the inbuilt repair tool may not repair it, while the other professions claim that if the repair capacity of the inbuilt tool can be enhanced, then damaged PST file of any level can be perfectly repaired. With the change in MS Outlook version, the capacity of inbuilt repair tool has also been enhanced. Find Outlook on the Processes tab. Right-click on Outlook and select “Open File Location”. 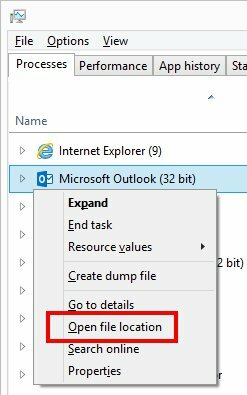 You will see Windows Explorer opens the folder in which Outlook is installed. Scanpst is primarily present in the same folder. Once the location of Scanpst is well-known to the user, it becomes easy to perform repair function of corrupt PST files. The performance of inbuilt tool is bit likely to differ according to Outlook versions, but the end-product of this performance is repaired and stable PST file. Despite of looking for Scanpst in the Windows, experts also recommend to seek assistance from third-party tool for repairing of corrupt PST files. The third-party tool make use of powerful algorithm to repair the damaged PST files without disturbing the file sequence and data integrity. The third-party tool like Kernel for Outlook PST Repair have been designed to meet the requirements needed to repair the PST file saved even in worst condition. Kernel for Outlook PST Repair provides different saving option that provides direct access and more secure platform that existing one.